Opened in 2010, Blue Ruth is the innovative jewelry design studio and retail space of owner Susan Pridham. A Long Island native Susan has always been fascinated by nature and anthropology. She handcrafts her jewelry using responsibly sourced materials with attention to style and detail. Blue Ruth also offers an ever-changing selection of other artists and crafters. Open year round. The bookstore’s inviting space attractively displays books on all subjects. You will find a great selection of new releases, best sellers, cookbooks, and more, and in keeping with Greenport’s seafaring history, a big selection of nautical books. 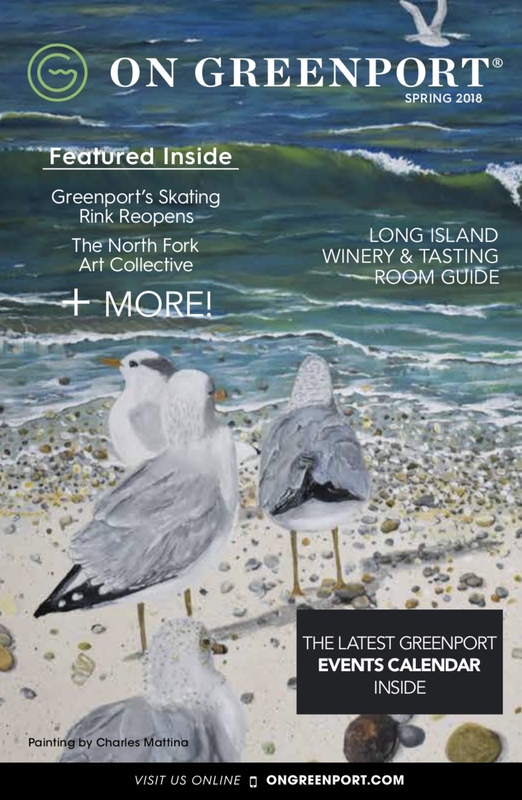 Books by local authors and books about Greenport and the North Fork are prominently displayed and can make great gift items. There is also a good selection of children’s books. Special orders are happily taken. This independently owned bookstore is sure to please everyone and is a great place to browse. Long Island’s premier goat dairy farm specializes in fresh and aged artisanal cheeses such as creamy chevre, tangy little blocks of feta, and waxed specialty cheeses, which are a perfect match for Long Island wines. Goat milk is a natural moisturizer containing over 50 nutrients and Catapano Dairy Farm makes a variety of soothing goat-milk beauty products using fresh goat milk from their herd. Tour the farm and see the goats and their babies. Open seven days in season from 10:00am–5:00pm. Call for seasonal hours. Latest trends at a reasonable price! Along with Junior apparel, they have wonderful items for children, toddlers, and infants. Their collection of clothing and accessories, dresses and separates, swimwear, shoes, hats, handbags, sterling silver and costume jewelry make it a fun place to shop! Open daily, year-round, with extended hours on the weekends. A “lifestyle” store, this new shop in the village is the brainchild of Carrie Tintle who believes that “life is too short to wear boring clothes.” With a varied inventory of women’s clothing, men’s clothing and accessories, shoppers can go for one-stop shopping. Carrie has selected skirts, pants, jeans, tops, dresses, lingerie and handbags from domestic and foreign producers, including dresses from the Brazilian line Agua De Coco, Michael Stars T-shirts, and lingerie from Commando and Fogal. She also carry fragrances, organic skin care products from Anne Marie Borlind, and jewelry from Morra Designs, Botkier and other designers. A collections of men’s shirts from Stone Rose make up the growing men’s collection. Offering handbags, jewelry, shoes and sandals, belts, wallets, jackets, gloves, hats, travel bags, briefcases, watches, sunglasses, and a selection of accessories and gifts for men and women; their latest addition are bangles from Alex & Ani and fine jewelry from John Medeiros. They have the largest selection of Brighton products in the Northeast, in addition to lightweight handbags from Baggallini and Vera Bradley, jackets and vests from Outback, Naot shoes and sandals and spring footwear. Open year-round, daily, in season. Doofpot has an incredible variety of beautiful Italian hand-painted ceramics, tableware, planters, Tuscan tables and hand-blown Venetian chandeliers and glass. Owners Maryanna and Jaap travel extensively, and stock the shelves with unique imports, including jewelry by Angela Caputi from Florence, and Sent from Murano. Visit the Greenport location, or the sister store in Palm Beach, Maryanna Suzanna. Offering shipping and delivery. Greenport’s go-to spot for beach apparel and lifestyle products. With a carefully selected mix of designer and surf apparel brands, they’ve got you covered! From gorgeous, figure flattering designs for women by Free People, Rip Curl, and Wildfox, to the latest trends in men’s styles by Billabong, Tommy Bahama and more. You’ll also find TOMS shoes, skate boards, and an impressive selection of stand up paddle boards for rent and sale. The large sunglasses collection includes Costa, Maui Jim, and Ray Ban. Family owned and operated, they have been providing the highest quality surf and skate gear on the East End since 1996. Open year round. Gallery M showcases distinct, contemporary craft works from the United States and Canada. The gallery represents artists who produce high-quality, one-of-a-kind signed art pieces in a variety of mediums, including ceramics, glass, metal, wood, jewelry, fiber, and fine art. (See galleries page 29). A magical place for all ages. Goldsmith’s carries beach toys, sporting goods, kites, puzzles, electronics and so much more, including Thomas the Tank Engine, Playmobil, Melissa & Doug toys, Legos, Breyer Horses, and Lionel trains. Art supplies are also available. Open daily, with extended summer hours. “Everything We’ve Got is Hot” is the motto of this store on Main Street. Offering hand rolled cigars as well as other varieties, they also offer cigar delivery! Keeping to their promise, you will find a great assortment of things that involve heat or fire, like hot sauces from around the globe, along with hot salsa, jellies, bloody mary mixes, and more. The store is the Vapor Shop Express in Greenport. You can also find roasted coffee and tea, as well as candles and incense. Open daily in season. The lavender fields in full bloom are an incredible sight and the fragrance is heavenly at this 17-acre farm in East Marion, two miles east of Greenport village. The brightly-colored post-and-beam barn offers honey, fresh-cut lavender, dried bouquets, lavender sachets, essential oils, and lavender home décor and ceramics. There is a $5 fee to go in the fields during blooming season. Open daily, June, July, August, and September. Weekends only, May and October. Visit Lydia’s for a step back in time. Browse a full line of antiques, furniture, glassware, linens, household items, garden decor including bird baths and bird houses, and almost everything from the late 1800’s to the present. The collection of antique and modern stained-glass windows and lamps will amaze you. For over 34 years custom stained-glass orders and repairs have been their specialty. The resident Golden Retriever looks forward to seeing you. No credit cards. Open all year, 11:00am–5:00pm. Closed Tues. and Wed.
At Not Just Bows you can find something for the whole family. The store’s large selection of hats for men, women, and children include brands such as Tommy Bahama and Tilley, and also a lovely selection of derby hats for that special occasion. Come here for the largest selection of Havaianas Flip Flops in the Northeast, along with jewelry, clothing, accessories, and a kid’s section with toys. A great place to find that perfect gift. 10:00am-5:00pm. Closed Tues. and Wed.
More of a SUP Boutique than a surf shop, One Love Beach offers products for the whole family and a meeting place for outdoor enthusiasts of all ages. You can find the largest selection of stand up paddle boards and accessories on the North Fork as well as skateboards, scooters and men’s and women’s apparel, footwear and accessories, including sunglasses. Everything from Go Pro cameras and books to artwork and ukuleles. More than just a place to rent and buy paddle boards, One Love Beach offers information and equipment to get outside and stay outside. PasParTou offers an array of products ranging from bed linens to furniture, art, gifts, and jewelry. Each unique item is hand-picked by the owner who is often inspired by European cultures. Drawing from the time spent on neighboring Shelter Island and a seafaring way of life, PasParTou is the tangible reflection of the owner’s ties to sailing, featuring maritime themes and nautical touches that work equally well in a relaxed coastal village or more formal city settings. At this boutique every woman can satisfy her fashion needs and cravings. They offer a large and unique collection of jewelry, handbags, sleepwear, sandals, shoes, scarves, and accessories, along with lots of lingerie and bathing suits. Simply Beautiful has the latest fashion for every season in a wide range of pricing and sizes. Open year-round for local and visiting customers. A must-stop when visiting the North Fork. Walking into this store is like stepping back in time. A large selection of vintage clothing, for both men and women, including shoes, accessories, jewelry, and hats. They also stock vintage furniture, home furnishings, and vinyl records. Unique treasures and one-of-a-kind items can be found in this vintage emporium.